I've purchased a few sets of Taps & Dies from you over the past couple of years, mainly for my model engineering needs. What can I say? Exceptional customer service and top quality products! 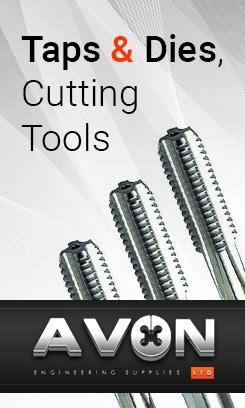 I recommend Avon Tap & Die to anyone who'll listen! Keep up the excellent work, guys (and gals!). Just a quick note of thanks for sending out the zeus book missing from my order. Fantasic sevice, for which I will not hesitate to use you again. We received the dies and they worked brilliantly - thank you! Would you mind sending me a copy of the invoice by e-mail please? I need to start justifying my spending on the departmental credit card! The UNF tap 11/16" - 16 was duly received. Thanks and regards. Thanks for the 5/8 UNC taps and die, they arrived safely on Wednesday. I have already used them. Thanks once again for your prompt service. No doubt I shall be in touch to order some more items as need arises. Thanks for your order update. I was very impressed with your prices and deals etc. and will pass your details on to my network of engineering friends that I work with. Just a quick note to say how pleased I am with the tap and die set received today. Visibly superior to the set I sent back twice to an un-named company!! Received my order early this morning and job completed before midday. A very big thank you to you and your team for the quick response and speedy delivery. Thanks for the speedy response to my order, it came this morning and did the job perfectly. Once again, many thanks. Diestock arrived this morning 24hrs after I'd ordered it. May I take this opportunity to say how impressed I am with you're service. If any of my friends require any of your products I shall not hesitate to put them in touch with you. Thank you so much for your excellent service to me, the tools cut a perfect thread. Just to say thanks for helping me out with my wrong order. The correct (1.5) taps arrived this morning, and I trust my returned ones will reach you as quickly. Excellent service, much appreciated; I'll recommend you when the opportunity arises! Many thanks for your excellent and recommendable service. I received my order at 10:30 this morning. I ordered a 5/16" UNC bottoming tap last Friday over the phone since your website was down. Just to say thanks for prompt & courteous service, especially considering such a low value order. Tap arrived Monday & job completed. Thanks again. Goods arrived this lunchtime, so I'd just like to thank you for the excellent quality of your goods and service! Hello, this is the first time i have used your company, which i found through google. I would like to thank you for your quick delivery and very good Split die, which i used today to finish a urgent order of 50 shoulder screws. I have now put you down on my supplier list. Excellent delivery, and just seeing your products you can see the quality and they did the job well... you will be getting all our future orders. Thank you very much! After all the rubbish we’ve been sent from various places IT'S SO NICE TO GET A GOOD QUALITY PRODUCT INSTEAD OF THE CHINESE RUBBISH GOING UNDER DIFFERENT NAMES. Very impressed by the performance of the die I bought from you. Recut the thread in a damaged crank pulley shaft on an old Alfa and worked a treat! Happy New Year! Hi, no questions, just many thanks for a speedy delivery and brilliant product. Brilliant, HSS M20 X 1.5 through my letterbox this morning. Dry up here so under the bonnet of the little Aixam I went to clean up a thread on the clutch/drive shaft. Your die did a splendid job – the new nut fits a treat. Now for the new drive belt and torquing it all up. Great service, great product, great value. Thank you for a lightning service and quality products. I received this on Friday morning, less than 24 hours after the order.